I was a fan of Christian Slater’s television show, The Forgotten. It only lasted one season, seventeen episodes, actually, but my wife and I were drawn into the emotional cases and the cast of characters that were so deeply affected by the unidentified bodies. At the time, I didn’t know that Todd Matthews, the Director of Communications & Case Management for NamUs, the man who solved the “Tent Girl’s” identity after decades, was a consultant for the show. I knew the show was supposed to be based on real work by civilian investigators, but the background of those agencies and civilians was pretty murky. Just last week I found Deborah Halber’s excellent book on the whole civilian investigation movement that formed the National Missing and Unidentified Persons System (NamUs). 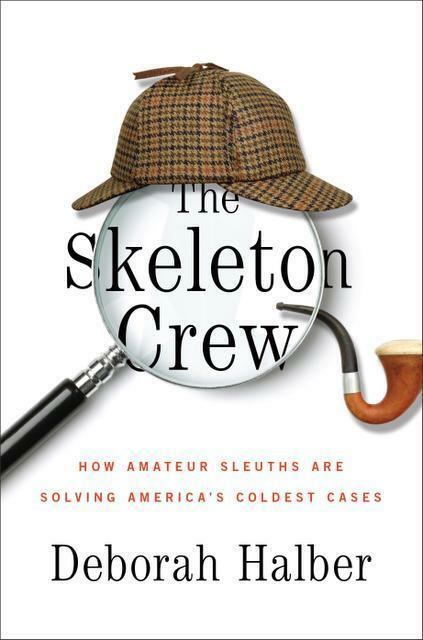 The Skeleton Crew: How Amateur Sleuths Are Solving America’s Coldest Cases is a fantastic read, though it will be a somewhat difficult read for readers and interested parties who want a simple chapter-by-chapter, case-by-case format. Halber’s book is intensely enjoyable from the layman’s perspective, and for anyone who wants a BIGGER PICTURE story of what was going on with these people. Halber opens the book with the discovery of a body (or a part of a body), which is where most of these cases start (though sometimes there’s a disappearance they also work on). Just as I was deeply intrigued by “Tank Girl,” Halber drops into stories that feature other cases and other investigators. The really unique aspect of the book that I loved was that, like in every good mystery, all the threads of the story wrap up at the end of the book. Many nonfiction readers might not like the way the book is laid out with the jumping perspective and caseload, but once I saw what was going on, I stayed with it and read it in two sittings. The portrayals of some of the major players among the civilian investigators and the infighting is illuminating and captivating. Halber reveals them to be mostly isolated, driven people who end up straining family relationships. In other words, these civilians are the same kind of dedicated investigator traditionally hired for police and investigative agencies around the world. The book is written so compellingly, I couldn’t put it down, so be warned and realize that you may want to carve out some serious time for this one. I learned a lot of things from the book and I plan on revisiting it in the near future. If Hollywood is listening, I’d really like to try something scripted again! It’s a nice break from the real cases! Or even a series of novels. Those would be fun too, I think. I’d love to partner with someone on a project like that. We’ll have to talk at some point! I’ve written a lot of books and this is interesting to me. Lots of possibilities. This entry was posted on August 31, 2014 at 12:54 pm and filed under Audiobook,Crime,detective,ebook,Forensics,Nonfiction. You can follow any responses to this entry through the RSS feed.